There's not only one way to write about what the First World War brought to music. We see at least two (does anybody see more?). Firstly we should depict the Great war as a singing war. Think about the importance of war songs among soldiers and for the mood of the troops. The preservation (perhaps by digitalization?) of that huge cultural and linguistic heritage should be one of the aims of all Centenary international projects. Secondly, we could recall some great composers that somehow got involved in the Great War or contemporary musicians that still draw inspiration and contents from World War One. This is much easier and the reason why this new musical unit opens with this second option will be sooner or later evident to everybody: we have scores, recordings and even books. Not that difficult compared to the dirty but awesome job we foresee in the first side of the "singing war" (it would be nice to see something moving quickly in this first side). It's not a matter of "cultured" and "popular" music, since we should look (listen) to the war songs belonging to the Italian Alpine troops (and to any other troops) with the same level of attention we pay to the Futuristic music movement or to Ravel. Maurice Ravel is not new in Great War speeches. We all remember the Piano concert for the Left Hand he composed for Paul Wittgenstein (Ludwig's elder brother, who got amputation during the war and developed his original left-handed style). Ravel could not enter the army due to his poor health condition and joined the troops as a driver in the area of Verdun. 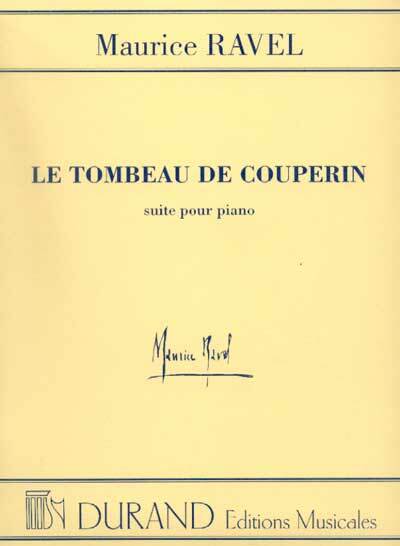 His popular suite for piano solo, Le tombeau de Couperin, apart from being an homage to François Couperin, is also a tribute to friends who died during the war. Each of the six movements is dedicated to the memory of a friend (the fourth, Rigaudon, is a double tribute to Gaudin brothers, killed by the same shell) and the whole suite remains as an outstanding example of what First World War injected into contemporary music. To learn more you could read this page.